The Yoshida Kōgyō Kabushiki gaisha (YKK Group) is a Japanese group of manufacturing companies. It’s the world’s largest largest zipper/zip manufacturerer but also produces other fastening products, architectural products and industrial machinery. What would later become YKK operated initially as San-es Shokai and was founded by Tadao Yoshida in Higashi Nihonbashi, Tokyo in January 1934. The company was renamed YKK in 1945. YKK has manufacturing facilities in 71 countries including several in China, one in Macau and…Hong Kong. 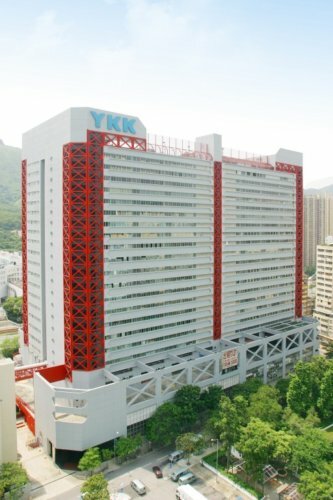 From the company website: YKK Hong Kong Limited was established in 1966 as a subsidiary of YKK Corporation. The company produces and sells zippers under the brand name of YKK, as well as other products such as plastic parts and tape notions. Our Tuen Mun factory building not only provides the production base in Hong Kong for the company as an industrial building, but is also available for rental to private tenants as a rental building. In order to achieve the goal of being a general manufacturer of apparel accessories, in 1992, YKK Hong Kong acquired ESBI, a company that produces and sells plastic buttons. In 1998, we fully funded the establishment of YKK Zipper Shenzhen Company Limited in order to service the emerging China markets more effectively. The authorized agent for YKK zippers in Hong Kong since the 1950s is Hung Cheong Import & Export Ltd (鴻昌), which was founded by Kwok Tak-seng (郭得勝, 1911-1990) and Yeung Yiu-chung (楊耀松, 1921-2003). The profits from selling YKK zippers formed the foundations of two multi-billion real estate fortunes as Kwok went on to start Sun Hung Kai Properties (which started out developing many industrial buildings before going into residential and commercial real estate) and Yeung became known as the king of industrial buildings (his Shun Cheong Co has developed at least 8 industrial buildings which are named after him and also owns many other commercial and industrial properties). As SHKP grew, Kwok Tak-seng handed the management of Hung Cheong to his younger brother Kwok Tak-biu and Tak-biu’s son Kwok Ping-yim (郭炳炎) although Tak-seng’s eldest son Walter Kwok stayed on the board of Hung Cheong.